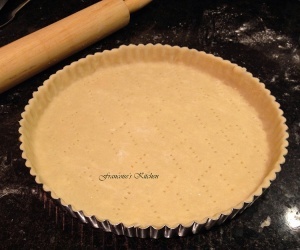 Pie Crust (Pâte Brisée in French) is a basic dough that you can use as any base of tart, pie, or quiche. It is really easy to make and the taste is so much better than what you can buy in a grocery store. The recipe below is perfect when using a 9 to 11-inch tart pan. Note that I typically prefer a thin crust, so I tend to roll the dough to the “maximum”. In a food processor, add the flour and salt. Pulse it to sift. 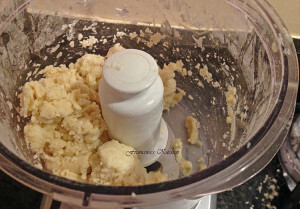 Add the cold butter and pulse a few times until the mixture looks like coarse crumbs. Pour the water 1 tablespoon at a time and pulse until the mixture just forms a dough. Put the dough in a plastic wrap. Press the dough into a flat disc and refrigerate until ready to use. When it is ready to use, I like to keep the plastic wrap under the dough so I don't need to add too much flour. It is also easier when the dough is rolled to put the dough around the rolling pin and transfer it delicately into the pan tart. Carefully remove the plastic wrap, arrange the dough and cut any excess. With the extra you can patch areas where the dough is missing. Press gently all around the edge. Use a fork and poke evenly all over. Chill until ready to use.